This guide describes how to install the KNIME Python Integration to be used with KNIME Analytics Platform. This guide refers to the KNIME Python Integration that was part of the v3.4 release of KNIME Analytics Platform (not to be confused with the KNIME Python Scripting Extension). The integration is the recommended and most recent way to use arbitrary Python™ scripts in KNIME Analytics Platform and supports both Python 2 as well as Python 3. The KNIME Python Integration makes use of an existing Python, which is installed alongside KNIME Analytics Platform. 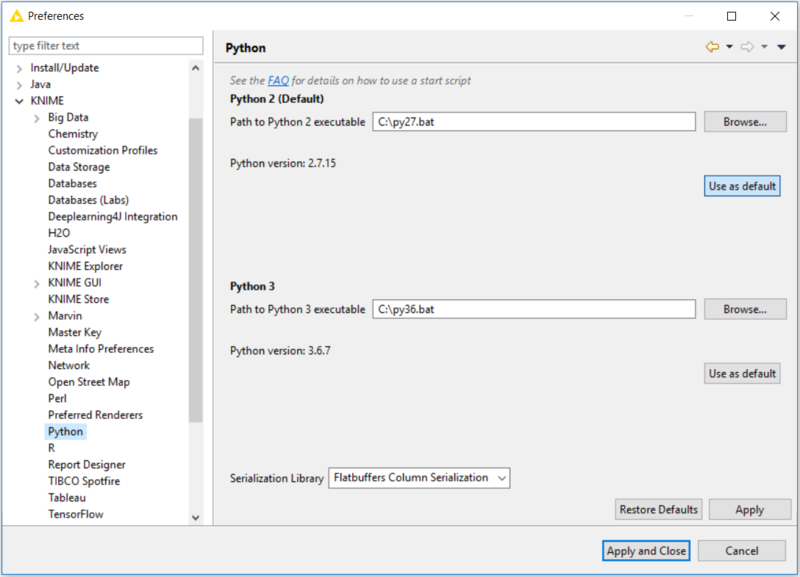 As the KNIME Python Integration depends on certain Python packages, the Python installation needs to have these packages installed. Our recommended way to set up such a Python environment is to use the Anaconda Python distribution from Continuum Analytics. In this guide we describe how to install Python and the necessary packages using Anaconda, as well as how to configure the KNIME Python Integration. This quickstart guide shows you the basic steps required to install the KNIME Python Integration and its prerequisites with Python. We do not provide any further details. If you’d like are more thorough explanation, please refer to the full Anaconda Setup Guide. Install Anaconda first. It is used to manage Python environments. Anaconda can be downloaded here (choose Anaconda with Python 3). Replace <PATH-TO-FOLDER> with the path to the folder that contains the configuration file you just downloaded. This will create a new conda environment named py36_knime, containing all necessary packages. # so that the source activate command works. Finally, point the KNIME Python Integration to the start script you just created. After installing the KNIME Python Integration go to the Python Preference page located at File → Preferences. Select KNIME → Python from the list on the left. In the page that opens, specify the path to the sh/bat file you created for Python 3. Assuming everything is correct, the Python version is now shown in the dialog and you’re ready to go. The above guide installs a Python 3 environment. If you want to install Python 2, you’ll find the respective configuration file in the Anaconda Setup guide. If you want to use the Python Script (DB) node, please see the additional instructions listed here. This section describes how to install and configure Anaconda to be used with the KNIME Python Integration. Anaconda allows you to manage several so called conda environments, which can contain different different Python versions and different sets of packages, also using different versions. A conda environment is essentially a folder that contains a specific Python version and the packages that are installed. Hence, it enables you to have several different Python versions installed on your system at the same time in a clean and easy to maintain manner. For KNIME, this is especially useful as it allows you to use Python 3 and Python 2 at the same time without running into version issues as Anaconda keeps each environment nicely encapsulated and independent of all others. Furthermore, Anaconda is able to create predefined environments with a single command and makes it easy to add Python packages to existing ones. Next, you will learn how to set up an environment that contains the needed dependencies for the KNIME Python Integration. First, you need to install the latest Anaconda version. On the Anaconda download page you can choose between Anaconda with Python 3.x or Python 2.x, however this only affects the root conda environment, which we will not use (as we are creating our own). Hence, you can choose either one (if you’re not sure, we suggest selecting Python 3). The above configuration files only contain the Python packages that the KNIME Python Integration depends on. If you want to use further Python packages in KNIME you can either add the name of the package at the end of the configuration file or add them after the environment has been created. This command creates a new environment with the name provided at the top of the configuration file (of course you can change the name), and downloads and installs all of the listed packages (depending on your internet speed, this may take a while). If you want to use both Python 3 and Python 2 at the same time, just repeat the above steps using the respective configuration file. The list of dependencies for Python 3 and Python 2 is almost the same, however version numbers change. After Anaconda has successfully created the environment, Python is all set up and you are ready to proceed with Setting up the KNIME Python Integration. If you want to use the Python Script (DB) node, please see the additional instructions listed in the section Dependency for Python Script (DB) node. Further information on how to manage Anaconda environments can be found here. Just replace <ENV_NAME> with the name of the environment in which you want to install the package. Further information on how to manage Anaconda packages can be found here. If you plan to use the Python Script (DB) node, one additional dependency (jpype1) is required that is not provided by Anaconda. However, it can be easily added to a conda environment using the standard Python package manager pip. This section describes how to install and configure the KNIME Python Integration using an existing Anaconda environment. If you did not yet set up Anaconda and/or the recommended Python environment, please refer to the Anaconda Setup guide. From KNIME Analytics Platform, install the KNIME Python Integration by going to File → Install KNIME Extensions. The KNIME Python Integration can be found under KNIME & Extensions or by entering Python Integration into the search box. In order to use the previously created Anaconda environment for the KNIME Python Integration, you need to create a start script (shell script on Linux and the Mac, bat file on Windows). These example scripts need to be edited in order to point to the location of your Anaconda installation and to activate the correct Anaconda environment. I.e. replace the <PATH_WHERE_YOU_INSTALLED_ANACONDA> with the location of your Anaconda installation and <ENVIRONMENT_NAME> with the name of the conda environment the script should start and which you created in the Anaconda Setup guide (e.g. in this case py36_knime for Python 3.6 or py27_knime for Python 2.7). For example on Windows, create a new bat script named e.g. py36.bat (py36.sh on Linux or Mac) and paste the corresponding script to the file. On Linux/Mac you additionally need to make the file executable (i.e. chmod gou+x py36.sh). Once you have created the start script, you will be almost done setting up Python. The last thing to do, is to point KNIME to start script you just created. This can be done in the Preference page of the KNIME Python Integration located at File → Preferences, then on the list on the left select KNIME → Python. The dialog should look like the screenshot shown below. Figure 1. KNIME Python Preferences page. Here you can set the path to the executable script that launches your Python environment. On this page you need to provide the path to the script/bat file you created to start Python. If you like, you can have configurations for both Python 2 and Python 3 (as is shown above). Just select the one that you would like to have as the default. If everything worked out fine, the Python version is now shown in the dialog window and you are ready to go. You can choose which serialization library to be used by the KNIME Python Integration in order to transfer data from KNIME Analytics Platform to Python. This option does not usually need to be changed and can be left as the default. notebook_version: The Jupyter notebook format major version. Sometimes the version can’t be read from a notebook file. In these cases, this option allows to specify the expected version in order to avoid compatibility issues. Should be an integer. only_include_tag: Only load cells that are annotated with the given custom cell tag (since Jupyter 5.0.0). This is useful to mark cells that are intended to be used in a Python module. All other cells are excluded. This is e.g. helpful to exclude cells that do visualization or contain demo code. Should be a string. The Python nodes support code completion similar to an IDE. Just hit ctrl-space (command-space on the mac) e.g. after knime_jupyter. in order to show the available methods and documentation (knime_jupyter refers to the imported knime_jupyter Python module, e.g. see script example above). The Jupyter notebook support for the KNIME Python Integration depends on the packages IPython, nbformat, and scipy, which are already included if you used the configuration files from the Anaconda Setup.